Jessica has a long history of organizing for environmental health and climate justice. In 2003 she interned with the Environmental Justice and Climate Change Initiative working with organizations across the U.S on issues of climate justice. In the Bay Area she helped shut down the PG&E Hunterspoint Power Plant in 2004 and successfully mobilized against a tar sands-dirty crude expansion of the Chevron Richmond oil refinery in 2010. She has conducted and co-published an National Institute for Environmental Health Studies (NIEHS) Air Sampling Study in Richmond, California for use to advocate against toxic chemicals that are known to cause and/or aggravate adverse health effects like asthma, developmental problems and cancer. 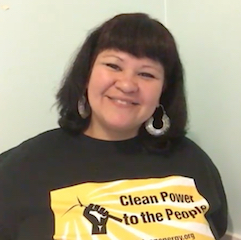 She currently organizes for “Clean Power to the People” as the coordinator for the East Bay Clean Power Alliance, campaigning for local clean energy solutions centered in justice through the nascent, Alameda County Community Choice energy program, East Bay Community Energy. She is excited to be doing work for a just transition to the clean energy economy with the Local Clean Energy Alliance. In addition to Jessica, other honorees include a Chief of a tribe in the Amazon who defended his people's land against big oil companies; a Masaai chief in Kenya whose cattle herds got wiped out by drought in the past; Nancy Rutigliano, who spearheaded Kids Against Pollution in Provincetown and Cape Ann, Massachusetts; Senator Ed Markey, a proven environmental champion in Massachusetts, and others. The Local Clean Energy Alliance thanks the Earth Society Foundation and Chair, Helen Garland, for the recognition of our work for local clean energy solutions. Most importantly, we thank you for your continued part in championing a just, clean energy economy!